There’s a scene in It’s a Wonderful Life where Clarence, guardian angel to James Stewart’s character George Bailey, comments that in Heaven, nobody uses money. A parallel may apply to a Bates construction project that has its own holiday connection. 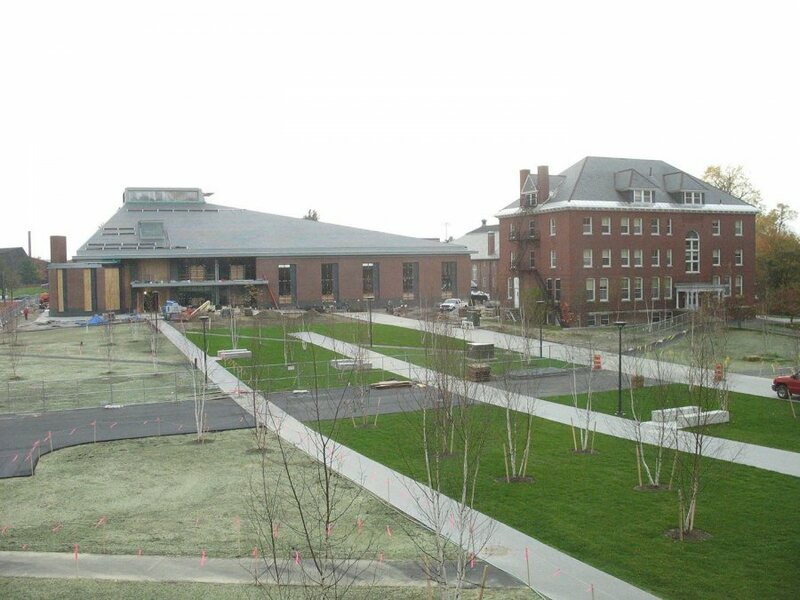 The project isn’t inspiring like Alumni Walk, magnificent like the new dining Commons or heartwarming like the new student housing. 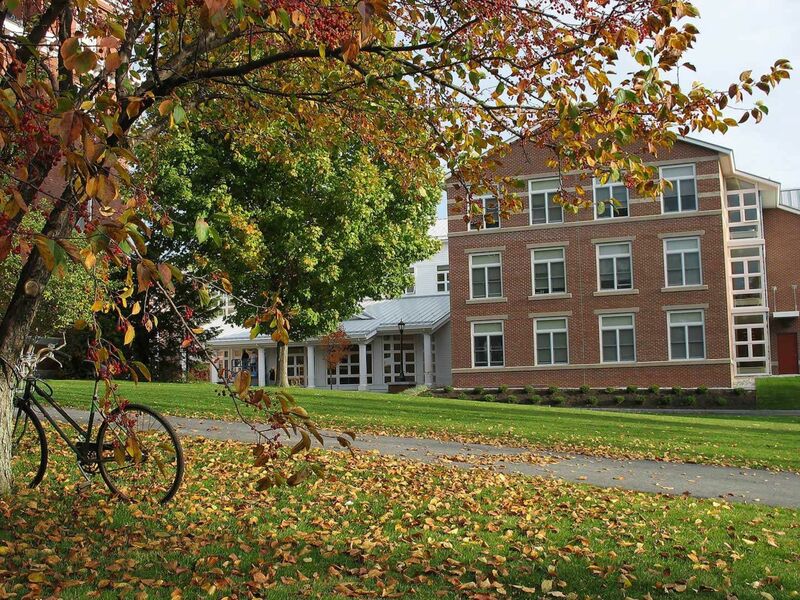 But a new parking lot behind Merrill Gymnasium that should open around Thanksgiving will come in handy, bub, easing the squeeze that Bates motorists have felt the past six months. An asphalt base coat for the 70-vehicle lot was laid Oct. 19. Between now and the holiday, a path will be paved from the new lot to the existing walkway between the athletics complex and Central Avenue. Merrill’s existing back doors will open onto new concrete pads and the parking area. The parking crunch began with the removal of spaces behind the old tennis courts on Central Avenue for the new Commons, and along Andrews Road for Alumni Walk. But Paul Farnsworth, manager of those projects, reported that the college will ultimately realize a net gain of 17 spaces. He added that three existing handicapped spaces near Alumni Walk are being widened and restriped to meet current standards, and four new spaces are being added next to them. Six spaces will be created next to the new Commons for service vehicles. Alumni Walk: If 90 percent of life is just showing up, as Woody Allen reputedly said, 90 percent of construction work seems to be paving. The major paving for Bates’ new east-west connector was finished on Oct. 22, Farnsworth reported. 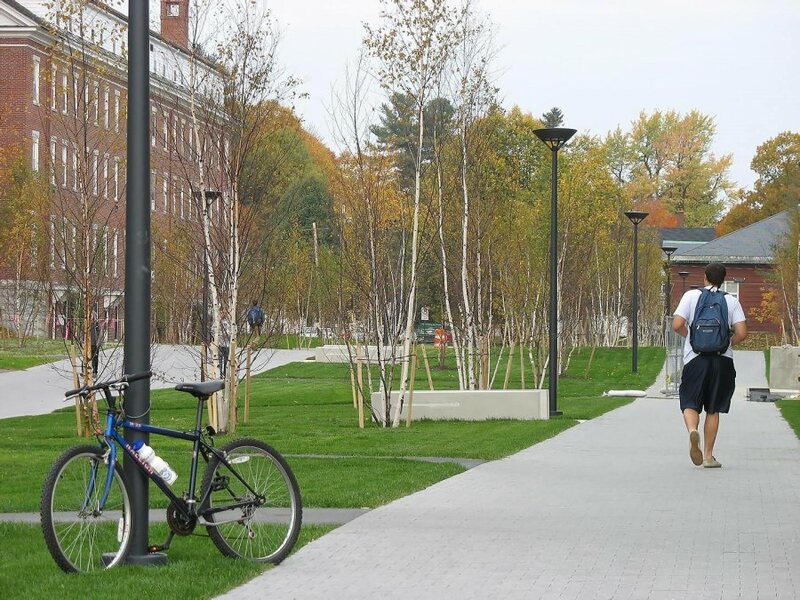 That includes the many asphalt paths that crisscross the walk and a larger blacktop expanse extending North Bardwell Street — better known as the parking area for Smith and Adams halls — across the Alumni Walk corridor. At the same time, the service road behind Chase Hall, from Campus Avenue to Alumni Gym, got its long-awaited final coat of blacktop. Also on the asphalt front, preparations are underway for a base coat at the foot of the new amphitheater, situated between Pettengill and Lane Halls and facing Lake Andrews. That base will be topped with an apron of the same cut-and-polished asphalt blocks used on the main Alumni Walk paths. Farnsworth noted that the concrete risers and the steps for the amphitheater are done. Finally in Alumni Walk news, installation of LED lights in the concrete benches has begun, and the job should be finished next week. 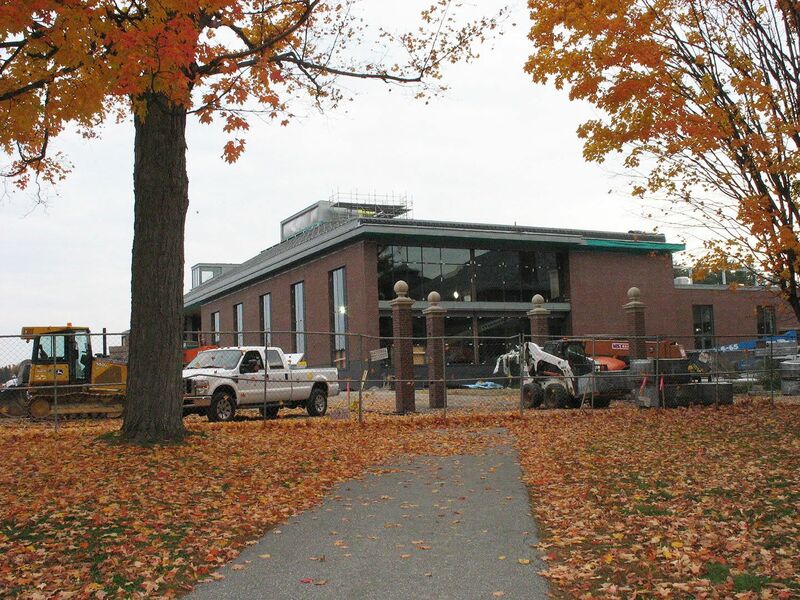 New dining Commons: History of sorts was made during the Bates-Middlebury football game Oct. 20 when Panther kicker Jack Britton’s extra point sailed through the uprights and smack into the huge windows on the Garcelon Field side of Commons. The first pigskin-glass contact in Commons history “made quite a thud,” said Jay Burns, editor of Bates Magazine. “You could see the glass vibrate.” The incident didn’t faze Farnsworth, also in attendance, who said that the contractor has no concerns about the glass breaking. Just in case, though, Farnsworth had already ordered a net to catch high-flying pigskins. In fact, most of the window glass has been installed, with the west entrance and the fireplace lounge among major features still unglazed. Farnsworth added that the skylight for the ventilation monitor — that big box on top of the roof — should be shipped by the end of the month. Once that’s installed, the last patch of slate roofing, on the south side, can be laid. All of this work will make the shell of the building essentially weathertight. Meanwhile, masons have made good progress laying pavers around the new Commons. 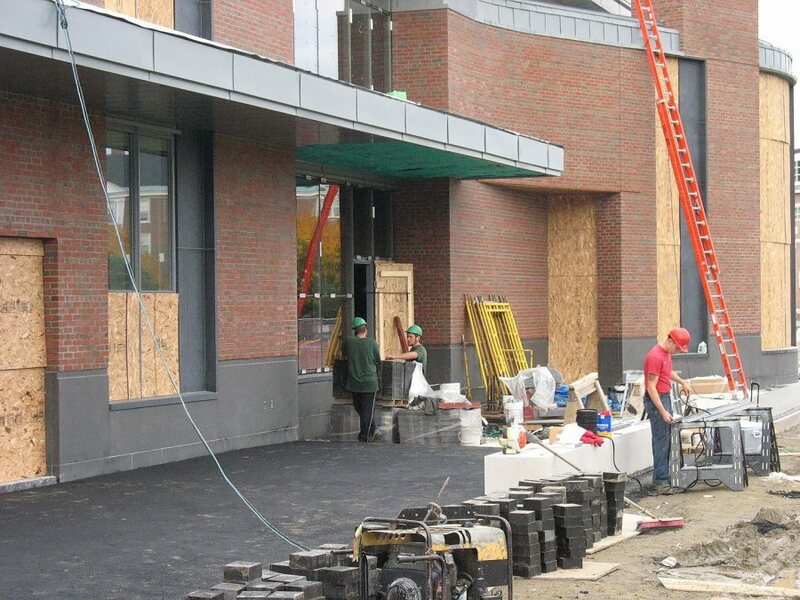 The main entrance approaches are being covered with the same kind of gray granite used at the College Street entrance to Alumni Walk, while walks and other areas get the asphalt blocks. Also echoing Alumni Walk is a sitting area along the north side of the building at the entrance to the Emporium, the facility’s “convenience store.” Here, along with a table and wooden benches, you’ll eventually find polished concrete benches resembling the risers in the amphitheater. Inside Commons, the recycled wood cladding on the dining hall ceiling is about half completed. And the paving — er, tiling — of the servery walls is in progress. There was a delay there, Farnsworth noted, because the tiles originally ordered from Italy were held up in shipping. They’ve been supplanted by tiles from Texas that arrived on the 20th. Finally, in our effort to leave no piece of paving news unreported, bub, Farnsworth said that concrete for the floor of the loading dock will be poured next week. The concrete is formulated to resist the corrosive effects of road salt. Readers write: Shirley Serrao ’11 wanted to know what provisions would be made for playing music in the new Commons. “The facility has an integrated speaker system,” Farnsworth replied. “The rooms are divided into zones that can be controlled independently for music or public address. New student housing: Serrao is likely referring to the fireplace in 280 College Street — specifically, in that signature gathering place called Frank’s Lounge. 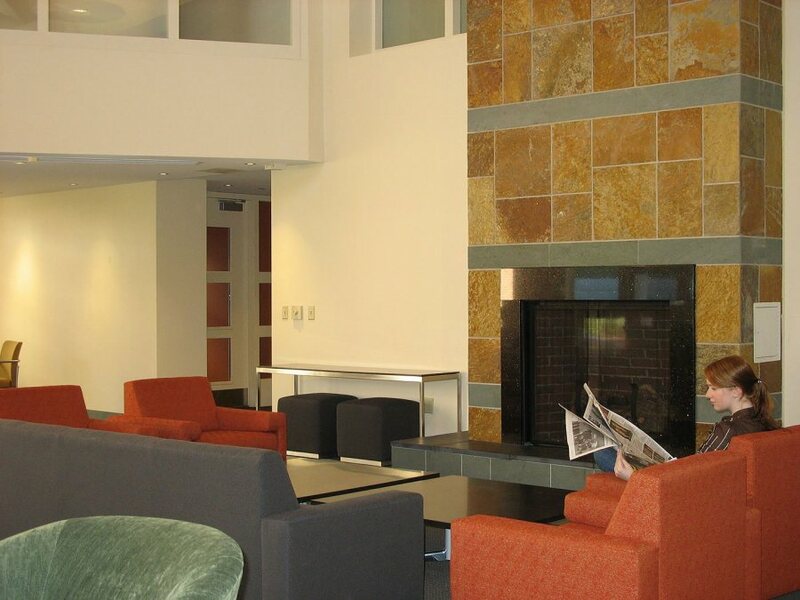 Made possible by a gift from Bruce Stangle ’70 and Emily Siegel Stangle ’72, the lounge named in honor of Bruce’s father, Frank J. Stangle, will be dedicated during a Trustee luncheon on Oct. 26. Meanwhile, about 10 workers, give or take a few according to the day, are still on the job at 280 College St. Some are continuing to work on exterior trim. Others are pursuing the building’s commissioning, a process in which a third party — local architecture firm Harriman Associates — is testing the building’s nonstructural systems. We were interested to learn from project manager Pam Wichroski that the commissioning process is now into the automated controls for systems such as heat, plumbing and some of the electrical. She explained that computers in Facility Services headquarters, two long blocks away at the Cutten Maintenance Center, are being tied into the residence’s computers so that these systems can be monitored and even remotely controlled. “For example, if there’s no hot water in a bathroom, we can take a look and make sure that the pumps are running, water heaters are running, what the temperatures are set at,” Wichroski said. “And we can adjust that remotely.” Facility Services staff are being trained to use these systems now. The same network of sensors, controls and computers will feed information to the “dashboard” monitor in the building’s center core enabling residents to monitor their resource use. This display, slated to go into service soon, will initially register the usage for the whole building. Later it will be modified to show data for different sections of the building. 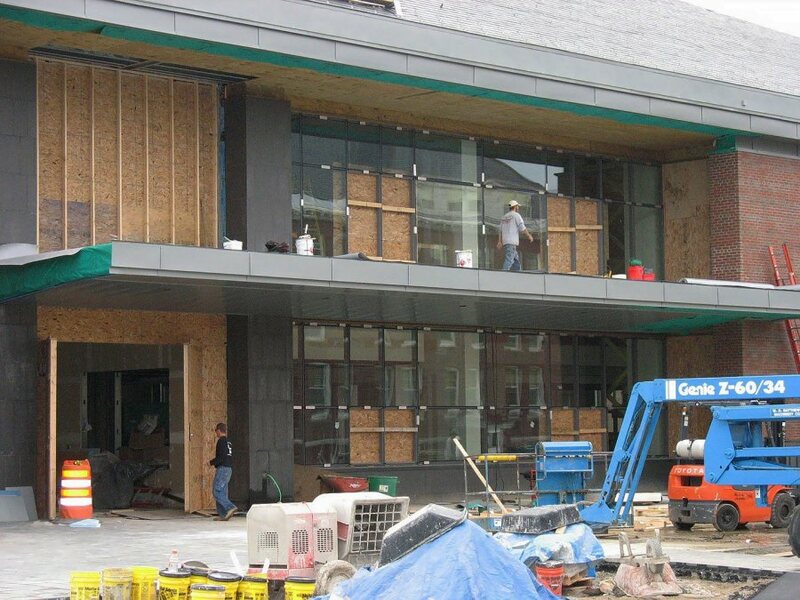 As for the exterior trim work around glass-walled areas that has been going on all autumn, the contractor has had issues in making the window system airtight, Wichroski explained. The College has brought in a third party to test and monitor this work, in a parallel to the third-party commissioning process mentioned above. “We’re making sure it’s absolutely right before the final finish goes on,” she said. Wichroski did not say “bub,” but we could hear it in her tone. Can we talk? What do you think about the campus improvements process? What would you like to know about it? What do you know that we don’t? We want to hear from you, bub. Please e-mail your questions and comments to Doug Hubley, with “Construction Update” in the subject line.